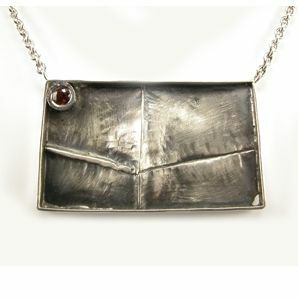 This necklace was created using a somewhat recently developed metalsmithing technique called fold forming. It measure approximately 2.5 x 1.5 inches and is accented with a 4mm bezel set spessartin garnet. The fold formed piece hangs from a curb style chain at 18 inches in length.